Beautiful setting with various private areas to suit your style and taste. A wedding open day not to be missed. 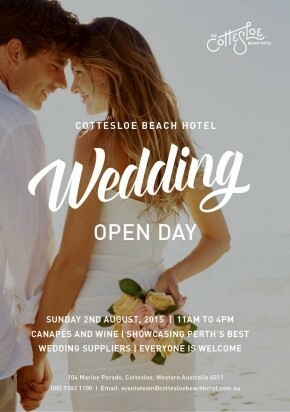 This Sunday August 2nd 2015, the Cottesloe Beach Hotel invites you to their wedding open day! And its FREE. Still looking for that perfect place for your special day? If the venue and award winning cuisine doesn't grab you, there will be a group of Perth's best wedding suppliers to inspire you! Canapes and Sandalford wines will be available for samples as you discuss ideas for your big day with wedding suppliers and peruse the various private areas to hold your special reception. You will not be disappointed, wedding packages come with many additional inclusions, as well as the award winning cuisine and premium beverages, not to mention the view. The helpful team at the Cottesloe Beach Hotel understand that your wedding reception should be uniquely yours and will work with you and go that extra mile to make your day truly memorable. So come to the Cottesloe Beach Hotel this Sunday August 2nd from 11am to 4pm and see the amazing venue they have available for your special day.